In Part 5 of this series, I briefly discussed a Russian tech investor named Yuri Milner. Truthfully, Milner deserves considerably more attention, but I’ll save the full history for another time. Here’s what I think you need to know now. Yuri Milner worked at Menatep Bank from 1995–1999 as both a General Director and the Deputy Chairman and Head of Investment Management there. While he certainly wasn’t the boss, Milner was, at least, upper management. Normally, the role might not merit much attention, but in this case, it’s worth discussing. Why? Because Menatep Bank was involved in a scheme by which the Russian mob’s boss of bosses, Semion Mogilevich laundered tens of billions of dollars through the Bank of New York. According to a report from The Guardian at the time, “$500m of the assets of Menatep bank passed through Bank of New York accounts belonging to offshore companies connected to Russia’s mafia godfather, Semion Mogilevich.” While a bit of skepticism about the actual amount of cash is warranted here, not least because Russian intelligence is the source of this information, there’s no denying Menatep Bank’s involvement in the money laundering operation. Milner was never implicated in the scheme, but the bank lost its license a few months after it was discovered. Various figures within the bank were accused of money laundering, but most escaped any charges. 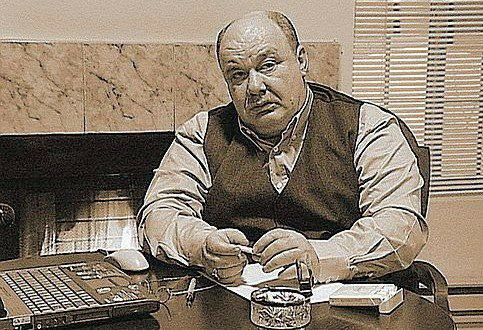 The architect of the scheme, Semion Mogilevich, evaded American authorities and made his way to Moscow, where he continues to live openly to this day. Since the turn of the century, we’ve seen Yuri Milner’s star rise quite considerably. As I mentioned, he’s invested in a wide array of tech companies in Silicon Valley, including numerous start-ups but also Facebook, Twitter and Zynga. He’s also been involved in massive deals in China (Alibaba) and Russia (MegaFon), among others. Yuri apparently has three secretaries working in back-to-back-to-back eight hour shifts, so there’s always someone available to take or make a call, even in the middle of the night. By all accounts, Yuri Milner is very good at what he does, but it’s important to note he’s a self-made man backed by the powerful Russian oligarch named Alisher Usmanov. Because while Yuri Milner likes to style himself as a man of the west, his money comes from the Kremlin’s highest levels of power. How do we know this? 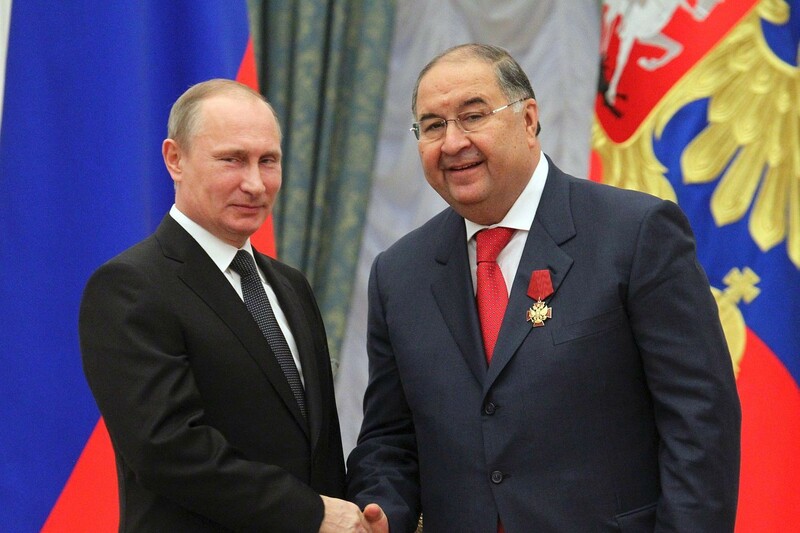 Because Alisher Usmanov is, like so many other Kremlin insiders, another “former” KGB man. Yet, it was the veteran KGB man Vladimir Putin who once said, “there are no ‘former’ Chekists.” While this attitude can be difficult for westerners to understand, it is an essential ingredient of Putin’s Russia. 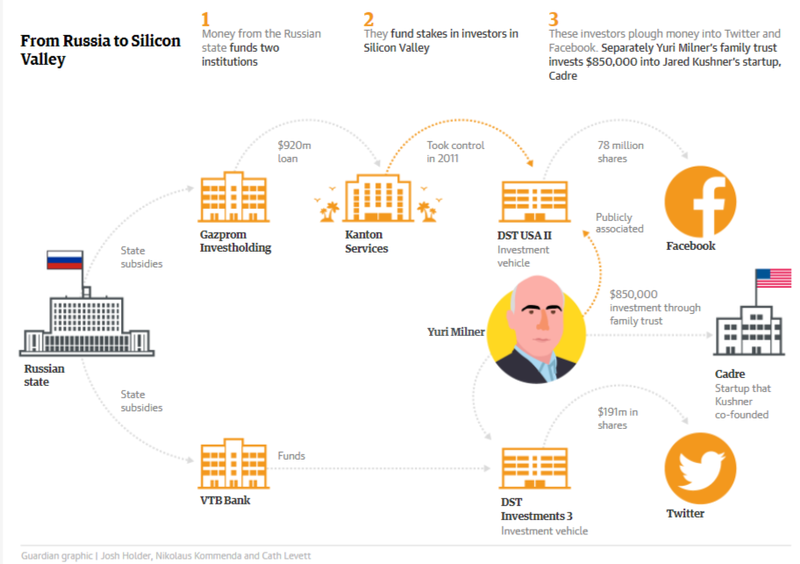 Yuri Milner’s money, specifically in his investments in Twitter and Facebook, originated from Kremlin-backed VTB Bank and Gazprom, according to a recent report in The Guardian. One does not receive money from the Kremlin without Vladimir Putin’s approval. It’s just not how he runs things. What’s interesting about Milner’s connection with the natural gas giant Gazprom is the company’s close associations with pro-Kremlin Ukrainian oligarch Dmitry Firtash and Semion Mogilevich. According to a Reuters investigation, Dmitry Firtash “said he had needed and received permission from a man named Semion Mogilevich to establish various businesses” in Ukraine. His primary partner in the country was Gazprom. 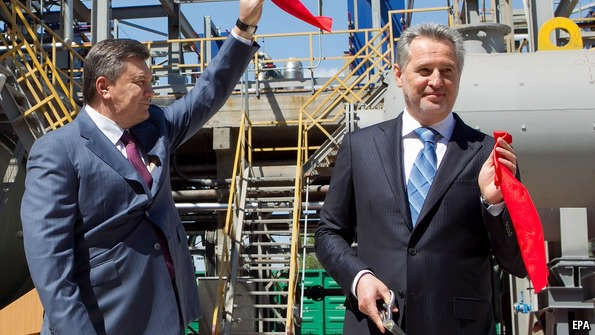 Firtash has long denied close ties to Mogilevich, but both men have been directors at the same company in the past. They also shared the same attorney, a man named Zeev Gordon, who was involved in Firtash’s company Eural Trans Gas in another venture with Naftohaz and Gazprom. Though Firtash may never admit it himself, he made billions in Ukraine because the mob — specifically Semion Mogilevich’s mob — allowed him to. This is not a bond simply or easily broken, nor has there ever been any real indication Firtash cared to break it. The other bank linked to financing for Yuri Milner’s investment in tech companies was VTB Bank, which is majority owned by the Kremlin and under U.S. sanctions. However, perhaps even more importantly, VTB Bank was lined up as an investor in the much-discussed Trump Tower Moscow deal that Michael Cohen, Donald Trump’s personal lawyer, attempted to strike during the 2016 campaign. But who was it that setup the financing for the Trump Tower Moscow deal? It was Trump’s longtime business partner in the Bayrock Group, Felix Sater. Here’s why that matters. Though not personally implicated in the Bank of New York and Bank Menatep money laundering case, Felix Sater was in New York around this time working for the mob. However, the New York Times first broke the story on Bank of New York’s involvement in money laundering operations for Semion Mogilevich in August of 1999. By that point, Felix Sater was already a cooperating witness for the government, having pled guilty in 1998 “to one count of racketeering for his role in a $40 million stock fraud scheme involving the prominent Genovese and Bonanno crime families, according to court records.” However, Sater’s involvement with Mogilevich runs deep. Mikhail Sheferovsky, Felix Sater’s dad, was a longtime underboss within the Mogilevich Organization. 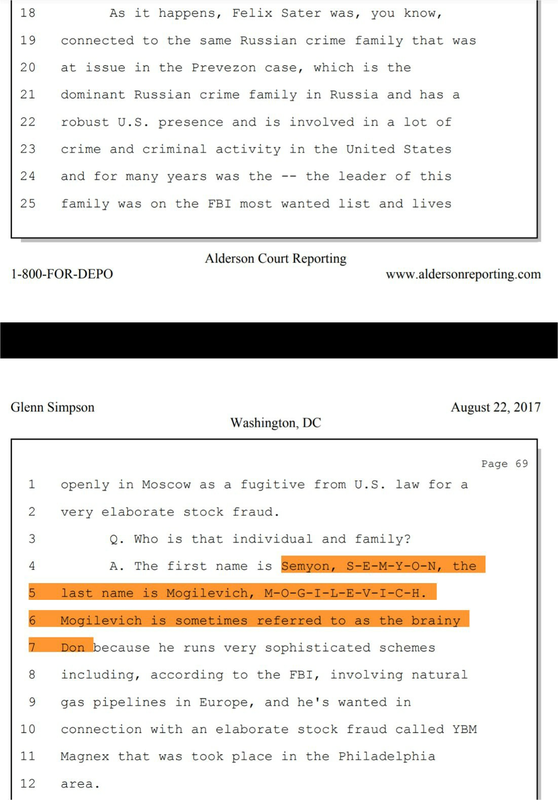 We recently received additional confirmation of Felix Sater’s ties to Mogilevich in the form of Fusion GPS’s Glenn Simpson. Here’s a copy of part of his testimony to Congress below. The testimony (seen above) made it clear that President Donald Trump’s longtime business partner, Felix Sater, is closely tied to Semyon Mogilevich. Some intelligence experts take issue with the Dossier, Fusion GPS and its explosive claims. I have my own reservations about plenty of Simpson’s testimony and the Dossier itself. We should be cautious and take nothing at face value. However, there are two things I’d like to point out. 1. This is not the first time Felix Sater has been linked to Semion Mogilevich. As I mentioned earlier, Sater’s dad was an underboss in Uzbekistan for the Mogilevich Organization. This is known. 2. The media LOVES to talk about the Dossier. They love to talk about the provokatsiya known as the “pee-pee” tapes. There was, of course, plenty of hype surrounding the unexpected release of Glenn Simpson’s testimony. Yet, still, has the MSM mentioned Semion Mogilevich’s direct connection to Donald Trump yet? No. So, why the hell not? There are several money trails to follow with regards to Kazakhstan and dirty money, but here’s one that hasn’t gotten much attention. I mentioned Eural Trans Gas (ETG) earlier because the lawyer hired by Firtash to do work for ETG, Zeev Gordon, has also admitted to doing work for Mogilevich himself. The same article from Foreign Policy goes on to discuss another man appointed as a director of ETG by Firtash, Andras Knopp. It was Knopp who went on to sign all the contracts between Naftohaz and Gazprom (yes, them again). One of the countries Knopp facilitated deals for was Kazakhstan. Unsurprisingly, Knopp was mentioned in a 2005 report out of the Austrian Federal Criminal Investigation Agency on the Mogilevich Organization. This article breaks down the timeline of events surrounding the gas trade in Eastern Europe, but what you need to know is Eural Trans Gas (headed by Andras Knopp) was eventually done away with in favor of the new company, RosUkrEnergo. RosUkrEnergo is of course the same company I mentioned earlier which is 50% owned by Gazprom. The other 50% belongs, at least officially, to Dmitry Firtash and his partner Ivan Fursin. The same article goes on to say, “A December 2005 report from the Austrian Federal Criminal Investigation Agency said the FBI described Fursin and Firtash as senior members of the Semion Mogilevich Organization.” So, authorities in Austria believe Andras Knopp, Ivan Fursin and Dmitry Firtash all work at the behest of Semion Mogilevich. Knowing this, it’s interesting to read additional reports of Paul Manafort’s ties to Ivan Fursin’s business partner, Dmitry Firtash, and a failed hotel deal they worked on together with Fred Trump’s (yes, Fred Trump, Donald Trump’s dad) money man, Brad Zackson. Perhaps there’s more there, right? Manafort and Trump are closer than you might think. In addition to being Trump’s campaign manager, Paul Manafort lived in Trump Tower. Manafort’s longstanding business ties to Donald Trump are extensively covered in my piece here. It is fair to say for a decade, at a minimum, Paul Manafort was devoted to the interests of the Kremlin first and foremost. Today, we learned of Trump’s refusal to enforce Russian sanctions passed by Congress. This decision can leave no doubt. Donald Trump’s loyalty lies with Moscow, not Washington D.C. The media isn’t doing its job. Some in the MSM may be compromised by Russian hackers who have set out, specifically, to gather compromising material on their personal lives. In many cases, the poor reporting of the last few years probably does come down to the fact that the ClickBait media model values drama over substance. However horrible Donald Trump may be, he’s great for article clicks, isn’t he? The issue we face right now is the MSM simply can’t, for whatever reason, get the job done here on their own. Democracy is at stake, and their reporting has been found wanting. Businessmen running business empires that include media outlets are, unsurprisingly, putting profits before our democratic institutions. It’s all about the money folks, and the mob certainly has a lot to go around. Thus, when Paul Manafort tried to publish a positive op-ed recently — with a Russian intelligence officer, no less — it was not all that surprising. The Russian intelligence officer, Konstantin Kilimnik, worked with Manafort in Ukraine for roughly a decade. They both worked for the pro-Kremlin Party of Regions out of Kyiv. The party maintained close ties to the oligarchs associated with Manafort, Dmitry Firtash and Oleg Deripaska, throughout the years Manafort worked for them. Though the media seems to frequently forget about Felix Sater, Donald Trump sure doesn’t. When Trump first took office, overtures were made to broker a “peace” between Russia and Ukraine in their ongoing war. Who did the Trump Team turn to for help? Felix Sater, of course, who came up with unsurprisingly pro-Kremlin terms for this deal. However he achieves it, Felix Sater does often manage to have his way with the media. After all, his mafia ties and partnership with Trump were written about extensively in 2007 in the New York Times. Yet the Times remains noticeably silent about Sater, even today. We wondered how this could be happening, and we wrote about our results here, if you’re interested. Regardless of what’s going on at the Times, we know a few more things about Sater. He’s paid for puff pieces about himself, and he has also been caught trying to pay for hit pieces to be written about his enemies. Felix knows the power the media holds, and he finds ways to wield this power to his benefit. 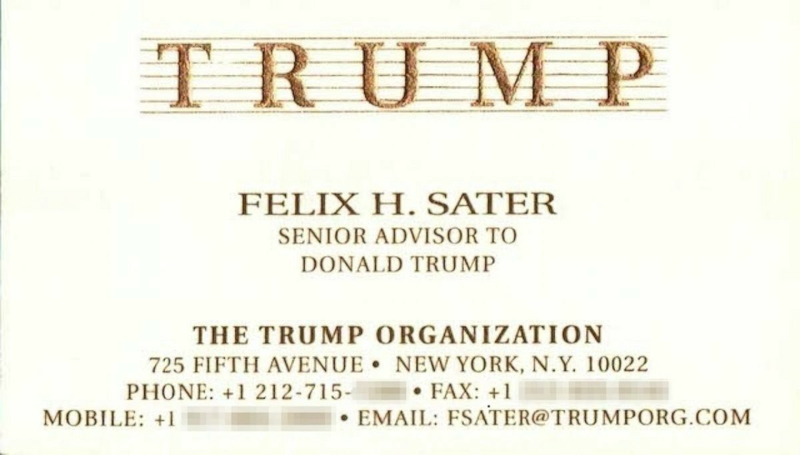 Sater was Trump’s business partner by 2003, at the very latest. Their joint business venture, Bayrock, was responsible for several real estate projects. This includes, Trump SoHo, Trump Fort Lauderdale, Trump International Hotel & Residence and several more failed ventures. When Donald Trump Jr. and Ivanka Trump visited Moscow in 2006, who went with them? Felix Sater did, and Sater even says he arranged for Ivanka to sit on Vladimir Putin’s chair in his office in the Kremlin. Notably, Ivanka Trump does not deny Sater’s claim. This point bears repeating too. When Donald Trump tried to reach an agreement to build Trump Tower Moscow during the presidential campaign, Felix Sater was the man Trump trusted to get the deal done. When Donald Trump and his campaign had an invite-only election night party, who showed up? Felix Sater did, of course! Felix Sater’s relationship with Semion Mogilevich never ended. How could it? They’re in the mob, and they’re both alive. Mogilevich was last spotted in Moscow attending a funeral in October of 2017. This isn’t a difficult concept, right? The mob is the mob. The rules don’t change. 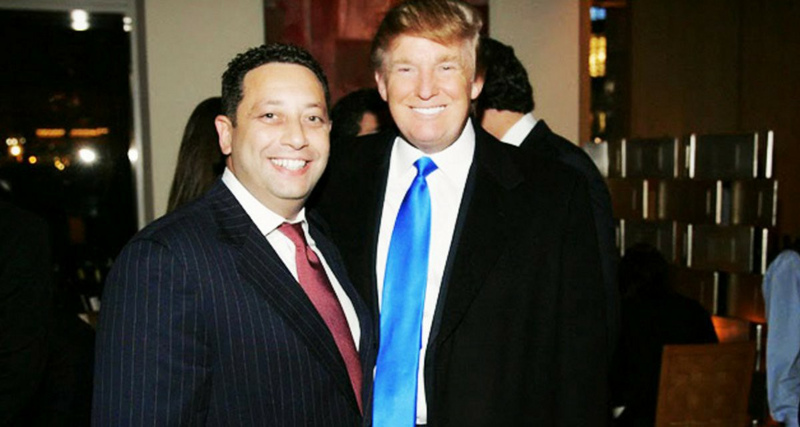 If Felix Sater’s relationship with Donald Trump had ended, do you think Sater would’ve been at a private party on election night? Reading through all this information, it may sound unbelievable, but it’s all too real. What’s unbelievable is the media is still not talking about it! Felix himself has never been shy about his connections to the Kremlin and organized crime figures. The story is there, but there have to be journalists and outlets willing to tell it. This story cannot be suppressed forever. It’s there for everyone to see, but it is going to take time to help the rest of the world understand. Keep talking about Felix Sater and Bayrock. 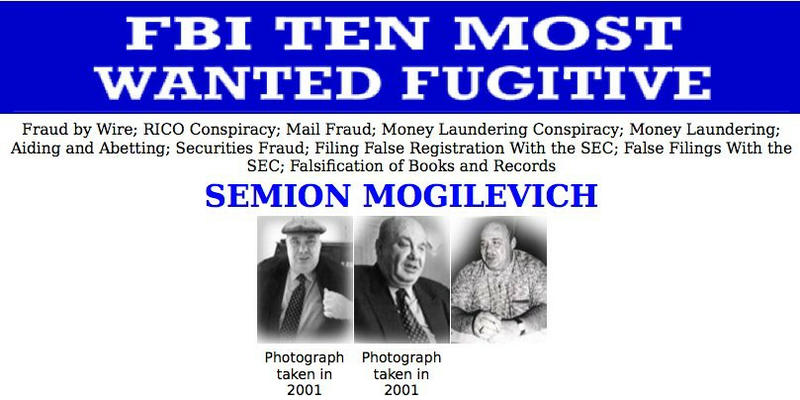 Tell everyone you know about Semion Mogilevich. Keep saying his name, even if the media won’t do it themselves. Someone has to. We can’t afford not to, because the Russian mob wants it all. They’ve had their hooks deep in Donald Trump for decades, but this doesn’t end with Donald. We can’t forget his son-in-law, Jared Kushner, in all this. The Russians, as well the Chinese, certainly haven’t. Jared has taken lots of meetings since Trump was elected, but maybe the most important was with the chairman of Vnesheconombank, otherwise known as VEB. In addition to being a close confidant of Vladimir Putin the chairman, Sergey Gorkov, also worked for Menatep Bank from 1994–97. Yes, the same Menatep Bank I discussed earlier. I’ll explore this further in Part 7. Stay tuned.